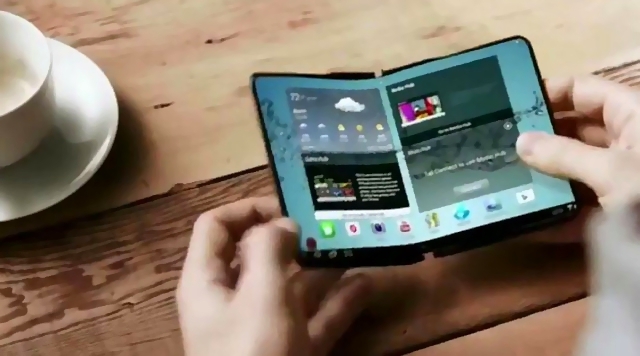 Samsung's new foldable device sounds remarkably similar to this prototype unveiled years ago. The South Korean manufacturer is planning to run a pilot program for its prototype foldable phone. Tens of thousands of such devices are expected to be ready by the end of 2017; they will be used to measure overall consumer interest as well as provide feedback on the UI. Bezel-less phones may be all the rage today, but Samsung still firmly believes that flexible handsets are the future. To test its theory, the company is embarking on a pilot production program for a prototype foldable smartphone later this year. Samsung's prototype actually uses two individual screens as opposed to a single display that bends in half. According to Korean news site ETnews, the two flexible 5-inch OLED displays are connected to each other by a slim hinge. The near-lack of bezels provide a "crisp screen." The two screens are optimized for multitasking and are not meant to be used as one continuous display. The goal of the upcoming pilot program is to gauge consumer interest in foldable devices. Samsung also wants to know how people interact with the prototype so that it can improve the user interface accordingly. As for how many devices will be produced, The Investor reports that up to 3,000 prototypes should be available in the first half of 2017. Samsung along with its display-making division are "accelerating development for ... tens of thousands" of additional prototypes; these should be ready by year's end. Don't expect to see a consumer version of this new prototype phone any time soon, though. Truly foldable displays still require much improvement before they are ready for mass production. In addition, Samsung currently is enjoying healthy profit margins from bezel-less displays; according to a previous statement, it sees no need to introduce a new type of device yet.